Researchers have found that women with breast cancer who have a low muscle mass are less likely to survive stage 2 and 3 cancers. The study titled, “Association of Muscle and Adiposity Measured by Computed Tomography with Survival in Patients with Nonmetastatic Breast Cancer,” appears in the latest issue of the journal JAMA Oncology. Sarcopenia refers to loss of muscle mass. For this study the team of researchers from the Kaiser Permanente, the University of Alberta, Canada, and the Dana Farber Cancer Institute compared patients who had low muscle mass or sarcopenia when they were diagnosed with stage 2 or 3 breast cancer with women who did not have sarcopenia. 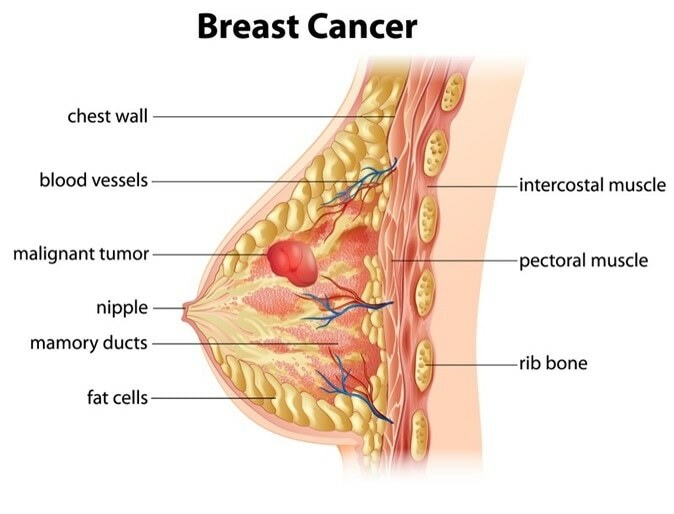 Stages 2 and 3 of breast cancer refer to growing cancer that has not spread to other organs from the site or origin at the breast. The team looked at 3,241 women diagnosed with breast cancer at Kaiser Permanente of Northern California or Dana Farber Cancer Institute between January 2000 and December 2013. Their muscle and fat mass was assessed at diagnosis using CT scans of the abdomen that showed that muscle and fat mass clearly. Sarcopenia was diagnosed in one third of the women (34 percent). It was defined as skeletal muscle index of less than 40. This index was calculated by measuring the muscles at a slice of the abdomen at the lower back (third lumbar vertebra). The square inch of muscle at that site divided by the height of the cross section in meters squared provided the index. For all the patients a follow up of at least 6 years was performed to assess their survival. What the team noted was that lower muscle mass meant poorer survival. The 34 percent women who had sarcopenia were 41 percent more likely to have died earlier than those who did not. Those with highest amounts of fat were 35 percent more likely to die early than those with a low fat content. Patients who had a higher amount of fat combined with sarcopenia were 89 percent more likely to die earlier finds the study. The authors of the study recommend a healthy body weight with adequate muscle mass for all women to have a better chance at survival of any disease including breast cancers. For this a healthy diet, lifestyle and regular exercise seems to be the need of the day. Experts suggest that to build muscles resistance training, weight training and strength training might be necessary.